Not many earwig species are found in North America (22) compared to the rest of the world. Categorized species of the Order Dermaptera (“Skin Wings”) contains nearly 1,800 species. Origianlly brought to North America by early trade ships, the earwig has become common in summertime months in the Midwest United States. Nearly all earwigs have curved forcep pincers and a segmented abdomen with six legs and antennae on the head. Pincers are used in a pre-mating ritual, for grabbing prey, and as a self-defense mechanism. They don’t, however, pose any serious threat to humans. Wings,short forewings and larger hindwings, are usually present but can be hard to identify and rarely used. 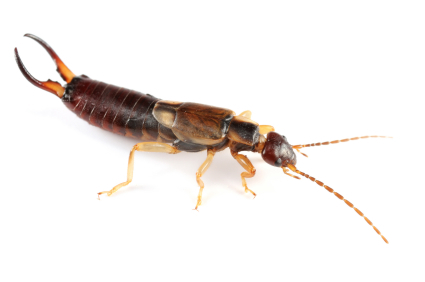 Earwigs will come out actively at night and generally, if undisturbed, lay motionless in hidden places during the day. As active hunters earwig’s diets are mainly small insects or plant life as well as some fruits – making them regular pests in many parts of the world. Females earwigs lay their eggs in a burrow. These eggs turn to larvae which are nurtured by the mother unless the larvae leave the burrow. The larvae molt in the usual way and adults are identified by the size of their pincers (larger = more mature). Several generations of earwigs can be prodiced by active adults in a calendar year. The name “earwig” came from the belief that these insects would crawl into sleeping people’s ears (and lay their eggs). However, this is not a habit of these insects – generally found outdoors in moist, dark, covered areas – unlike that of the human bedroom. Any insect can find it’s way inside a human ear – the earwig has no particular penchant for this. Despite this superstition, the rather feirce appearance of the earwig has led to the survival of the wifestale. Earwigs can become indoor pests, particularly in warmer states, and can also make homes in soil, in large numbers, to become outdoor pests.